Contemporary image from the period of his trial. THE TALE OF THE MURDER OF MARTHA REAY by Rev. 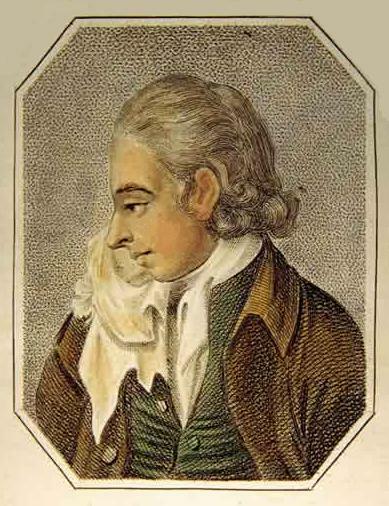 James Hackman, Rector of Wiveton in Norfolk, is a rich source of information about the England 0f 1779, beginning with the matter of how a somewhat aimless and unsuccessful young man was translated within a few days into an Anglican clergyman; how he never even visited his parish; and how his ordination was little more than a brief interruption in his single-minded stalking of a woman whom he had convinced himself loved him, as he did her – though she probably hardly knew more about him than his name. In my previous post, I set out the basic tale of poor Martha’s murder and the trial and execution of her killer, The Rev. James Hackman, Rector of the little parish of Wiveton, near Cley-next-the-sea on the North Norfolk coast. In this post, I will try to make clear how an unstable man, obsessed with a rich man’s mistress, could still find an entry to the Church of England, then ignore his parish to continue his obsessive stalking. Two questions arise at once: what sort of a priest was the young James Hackman, and how did he come to be appointed Rector of Wiveton? Answering these questions throws an interesting light both on the customs and expectations of the time and the parlous state into which the Anglican Church had fallen in the middle to end of the eighteenth century. Although the appointment of a young man like James Hackman to a remote, vacant living like Wiveton was far from unusual at the time, this does seem to have been an especially egregious case of nepotism, official disinterest, and religious laxity within the church. Thus the Newgate Calendar of 1779. This sounds simple enough, but there are already questions to be answered. Hackman was born in 1752. His grandfather, another James, was a ship’s carpenter and his father, William Hackman, was a lieutenant in the navy – not a successful one either, since he never seems to have risen above that rank in the whole of his naval service. His mother was a local girl called Mary Mathis. Only an uncle, Hyde Mathis, seems to have achieved even a modest gentlemanly status, owning land around Gosport and Southampton, as is shown by an Act of Parliament later in the reign of George III, when some of that land was requisitioned to improve the naval base. Maybe Mathis provided the money to buy James a commission, when the career his father had found for him, as an apprentice mercer, proved unsatisfactory. Even in an unfashionable foot regiment, it must have been expensive. Young James would also have been expected to buy his own uniform and sword and meet the costs associated with being an officer, including mess bills and, most especially, gambling debts. So far as we know, he never saw any fighting. When he joined the regiment, the bulk of it was away in the West Indies, leaving behind only those needed to conduct the constant recruiting necessary to offset the many losses due to sickness, desertion and other casualties. It was such a recruiting party that may have taken Ensign James Hackman to Hinchingbroke House, the home of the Fourth Earl of Sandwich, then First Lord of the Admiralty. Once there, he would have met the Earl’s long-term mistress, Martha Reay. Exactly what passed between them beyond conventional politeness, if anything, we cannot know for certain. There may well have been some flirtation, but it seems unlikely it went any further. Martha was some ten years older than him and had born the Earl many children. She was settled in a rich man’s household and was not known to be promiscuous. At best, Hackman was probably one of a good many young men, entertained by her lover Lord Sandwich, with whom she had conversed and flirted over the dinner table in those years. Hackman’s military career was brief. He obtained his commission in 1772, aged 19, but resigned it in 1776, when the regiment was posted to Ireland. Did James Hackman resign his commission because he disliked the military life; or to avoid being posted away from Hinchingbroke to a turbulent spot like Ireland, or some colonial outpost riddled with sickness? We do not know. Nor do we know how he spent his time between leaving his regiment and appearing as an ordinand. By 1778 then, he was seeking ordination in the Church of England. He had shown no religious inclination up to this time, so far as we can tell. As we shall see, none was considered necessary. James Hackman was ordained deacon on February 24, priest just four days later, and appointed to the living of Wiveton in Norfolk on March 1st, all in 1779. Hackman had no university degree or obvious background in theology,. We have no solid information that he had any regular higher education; he had been intended as a mercer, then lived as a soldier. He was simply ordained by the Bishop of Norwich and presented to the parish through the patronage of his uncle, Hyde Mathis, who held the advowson of the living of Wiveton. Was James Hackman truly ‘called to the priesthood’? Did he decide that the settled, respectable life and regular income of a clergyman would be more attractive to Martha Reay? If he felt any religious demands following his ordination, they were not apparent in his behaviour, since he left at once for London to continue his pursuit of Martha. Plenty of men followed careers in the eighteenth-century Anglican Church with seemingly little interest in religion or their priestly duties. Jane Austen was well acquainted with the oddities of the Anglican Church of her day. Her comic character, Mr. Collins, in “Pride and Prejudice” is an Anglican clergyman, though his oily and grovelling attention is firmly directed towards pleasing his patroness, Lady Catherine de Bourgh, who presumably presented him to his living, rather than to his parishioners. A rector would very often have interests well away from church matters, such as Gilbert White studying the natural history of Selborne. Others, like Parson Woodforde, not too far away from Wiveton in Weston Longeville, Norfolk, spent the bulk of their time socialising amongst the local gentry, eating and drinking prodigiously and undertaking sporadic preaching duties, usually where the rich or influential might be involved. Most employed a series of fairly poorly-paid curates to take the bulk of the services and attend to the needs of poor parishioners. They were not bad men. It was just how things were done at the time. Would this have been the life awaiting James Hackman? Would he have been able to afford to employ a succession of lowly curates? Martin Levy, writing of “This remote and windy parish near the East Anglian coast” claims the income of the rectory of Wiveton was under £50. Though he cites the Norwich Benefice Lists, I find this hard to believe. If it had been true, Hackman must indeed have been deluded to believe that marriage under such conditions would have been attractive to the mistress of a peer of the realm, even if she was as love-sick as him. The generally accepted minimum income for a gentleman in the mid-eighteenth century was £300 per year. It needed at least £20–25 a year (£1 per week) to maintain a bare subsistence, though the rural poor often had to manage on less, with the ‘help’ of the Overseers of the Poor. Wiveton may not have been a wealthy parish, but it ought to have been worth more than £50 a year in 1779. In 1836, the income was £207 per year (four times the amount a skilled worker would have earned). In 1845, White’s Directory states: “The glebe is about 30A. [acres], and the tithes have been commuted for £221 per ann.” In 1865, the rector’s income was again listed as £207. We would be on safer ground to assume the Wiveton rector’s income in 1779 would have been around £200 per annum; not a fortune, but enough for a modestly comfortable existence. The actual purchasing power would almost certainly have been far higher, given the enormous differences between taxes, prices and general costs in the eighteenth century and today. For example, when John Buxton built Shadwell Hall, a substantial brick house fit for a gentleman, in 1729, the basic fabric cost him some £500 to complete. With the total building and decorating costs, including all materials, fees, wages and the like, his house may have just about set him back £1000.. Even so, this level of income would hardly be sufficient to impress the long-term mistress of a wealthy, if often improvident, peer. Any but an obsessed and deluded suitor must have realised that his case was doomed from the start. It’s clearly impossible at a distance of nearly 250 years to assess the quality of anyone’s vocation to the Anglican priesthood, but the plain facts of how James Hackman became a priest and Rector of Wiveton cast a poor light on the standards prevailing in the eighteenth-century Church of England, especially regarding a parish in a remote part of Norfolk. That his first appointment was to Wiveton seems to have been mostly due to a combination of chance (the previous rector had died and was buried on January 22nd, 1779) and the patronage of his wealthy uncle. That it took place in such a manner and was subject to so little interest from the higher clergy seems to have been typical of the time. What we can say is that Hackman, after ordination, ignored his parish and headed directly to London, where he continued his pursuit of Martha Reay unabated. In the next instalment, I will be turning to the way the murder was handled by the media of the time; how it was systematically romanticised and the facts obscured; and how it became, in time, almost totally disconnected from the actual events of that evening outside the Covent Garden theatre. I will also try, as best I can, to disentangle at least some of the truth from the mess thus created; and show that Martha Reay was in all probability the innocent victim of James Hackman – a man driven by obsession and fantasy to become, in the end, a murderous stalker. This entry was posted in C18th Norfolk, Crime, Georgian Society. Bookmark the permalink.